The USA government regulations requires that all federal agencies should have a professional performance manager. The Performance Institute offers the certification program in its head office in Washington DC. 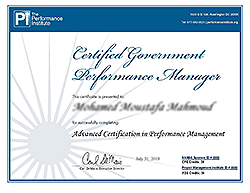 Now for the first time in Saudi Arabia, you can become a Certified Government Performance Manager (CGPM). 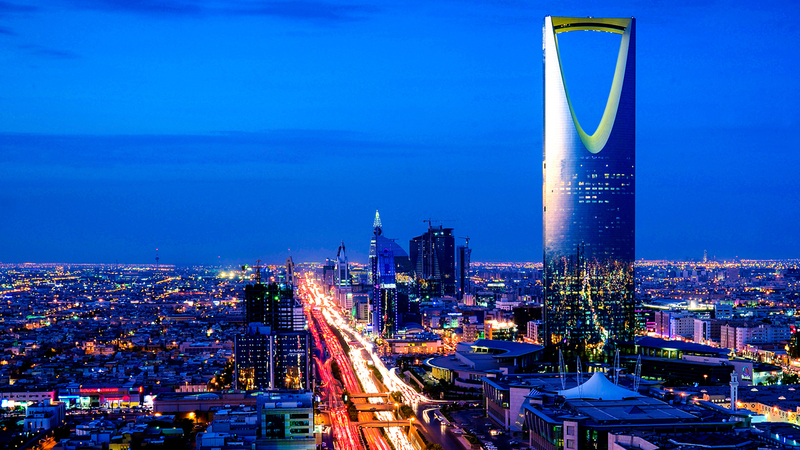 The certification program will be offered in Riyadh by the Institute’s founder and director. The Performance Institute (PI), located in Washington DC the heart of US Government, was founded in 2000 and has quickly become a leading voice on performance-based management in government and non-profits. In fact, the White House Office of Management and Budget has cited the Performance Institute as “the leading authority on performance-based management in government.” The Institute’s work has also been cited in numerous policy initiatives for management improvement throughout various levels of The United States government. The Performance Institute provides timely advice and how-to methodologies to government and non-profit managers through six delivery methods: research programs, conferences, training, certification, policy forums, and consulting services. The US Government Performance and Results Act (GPRA) requires that all government agencies should appoint a Performance Improvement Officer (PIO) and specified his/her role and responsibilities in managing the agency performance cycle (item 200.12 of Circular No. A–11.). Over the past two decades, The Performance Institute has trained over 25,000 personnel and their stakeholders and grantees in the latest methodologies and best practices for measuring and managing performance. 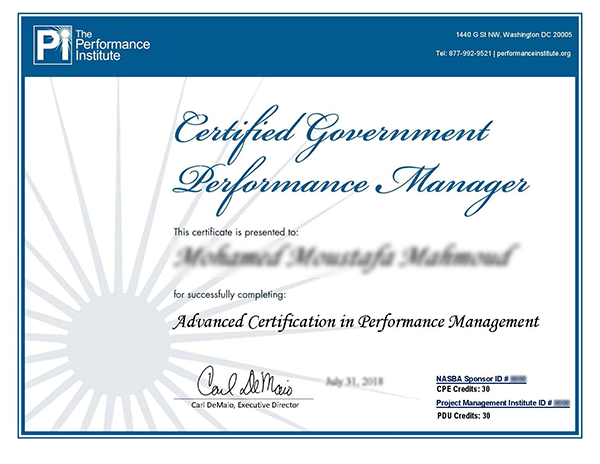 The Performance Institute offers the Certified Government Performance Manager (CGPM) program – the only recognized certificate program that comprehensively prepares government and non-profit managers to lead performance management initiatives within their agencies. The Institute’s programs are also accredited through several continuing education bodies including Project Management Institute and National Association of State Boards of Accountancy (NASBA). Strategic Planning: Utilize proven methodologies that work in local government to define Saudi Arabian priority goals (using customer and stakeholder feedback, strategic issue analysis, best practices, etc.) and cascade those goals to individual agency programs and functions. Performance Measurement: Develop meaningful performance measures to track outcomes and management progress in delivering agency programs to citizens. Collecting, Analyzing and Using Performance Data: Collect and report performance measurement information while embracing data analytics to better understand how to adjust and improve agency programs. Program Evaluation and Performance-Based Budgeting: Learn how to develop and answer evaluation questions about program achievements. Take advantage of proven processes for evaluation planning, performance management, performance reviews and Performance-Based Budgeting. Attendees will be equipped with a common thought process and language strategic planning, performance measures, and program evaluation – in preparation for efforts to revise its Strategic Plan and drive use of performance management techniques at all levels. Attendees will launch a disciplined approach to realigning resources – starting with alignment of programs to a Strategic Plan and continuing through both a performance measurement initiative and a performance budgeting effort. Attendees will then sustain the use of performance management throughout the entire organization because they will have acquired skills in a “tool kit” that can be maintained and replicated as well as receive their individual Certified Government Performance Manager (CGPM) status. Create clearly-defined mission and vision statements, organizational values, environmental analysis. Align program mission and performance measures for greater results and the ability to prioritize resource effectively. Identify the strategic elements and key lessons learned from building results-oriented programs. Learn how to use organizational goals and objectives to develop appropriate performance measure. Design effective performance measures to implement goals and strategies. Structure and align key indicators using several popular methodologies. Implement and manage through data to execute strategic goals and objectives. Learn how to develop and answer evaluation questions about program achievements. Take advantage of proven processes for evaluation planning, performance management, and program reviews. Strengthen accountability to support organizational growth and progress, particularly for budget request justifications. Utilize Evidence-Based Analysis to justify budget requests and secure grand funding while stimulating innovation. What are data analytics and how can they transform government management? Carl has authored numerous reform proposals at all levels of government in the US and guided successful implementation of those proposals with both elected and career officials. He is a nationally-recognized expert in a variety of government management topics including performance management, workforce transformation, program redesign, budget efficiencies, process improvement, acquisition and partnerships, and leadership of major change initiatives. He served the George W. Bush Presidential Council as part of an advisory commission for the US government. While serving on the San Diego City Council from 2008 – 2012, Carl helped define and implement a series of reforms that helped save that city from bankruptcy while improving service quality to citizens. In his role at PI, Carl also oversees the 2016 Transition to Governance Initiative that features a series of Town Hall forums designed to develop management reform recommendations for the next US Presidential Administration to consider. The project is modeled after a similar project Carl spearheaded in 2000 that helped shape US management reform policy for more than a decade. He is currently the Chairman of Reform California, a taxpayer advocacy group leading the way in various voter initiatives in this year’s elections. Established the American Strategic Management Institute. Served as a member of the San Diego City Council. Was a candidate for Mayor fo San Diego in 2012 and a candidate for California's 52nd congressional district in 2014 election. Paul Trampert, PI’s Director for Budget, Cost and Performance Integration, has over 40 years of leadership and management experience, including executive-level advisory in both the United States and 23 countries throughout the world. He has extensive experience, of which he held the role of Department of the Army Inspector General, designing, implementing, evaluating and integrating budget, cost and performance management systems to improve governance. He has conducted program analysis on behalf of the House Committee on Appropriations. Paul’s vision for consulting is to bring real-world application of innovative thought tempered by experience, and to build capacity to continue innovation in each organization he serves. Paul has supported primarily government clients, but also has provided cost, budget and program analysis services to the World Bank Group, the Global Environment Facility, and several commercial firms. His training, consulting and coaching engagements have taken him throughout the United States and Canada, as well as to the Middle East, Africa, Europe, and East Asia; his primary customers have been mainly Chief Financial Officers, Installation Commanding Officers, Parliamentarians and Members of Congress and their senior staff. He has frequently presented emerging cost, budget and performance concepts at venues such as the Canadian Association of Management Accountants, the Potomac Forum, the Consortium for Advanced Management-International, the Society for Logistics and similar professional organizations. Among his many services and accomplishments are three that demonstrate Paul’s dedication to innovation. First, he led a small team that authored the cost recovery methodology becoming most widely used in the US Federal Government today. In the past, Government cost accounting practices set fees and cross-servicing agreements on historical cost, sending organizations’ reimbursable programs into a tailspin and unable to support current needs. Paul’s methodology changed that by focusing on future costs and demands, thus increasing the likelihood that revenues would be there when costs are incurred while still complying with OMB guidance. Second, Paul had the privilege of helping the State and Entity Parliaments in Bosnia-Herzegovina pass convergent Audit Committee legislation; the Republika Serpska assembly chair remarked that this accomplishment constituted the first time the three bodies have been able to achieve convergence in legislation. Finally, Paul designed and provided the quality assurance regime to a nation-wide municipal level effort to implement Activity-Based Costing (ABC) within each municipality in the Republic of Uruguay that allowed the Ministry of Planning to compare performance across the republic. Pass the Certified Government Performance Manager (CGPM) examination on-site. Upon completion of your certification, you will gain both a professional distinction and academic credit. The Performance Institute has been reviewed and approved as a provider of training by the Project Management Institute (PMI)® and accredited through the National Association of State Boards of Accountancy (NASBA). Attendees of Performance Institute programs receive 30 CPE and PDU credits - which covers accounting/financial management and project management continuing education requirements for certification. Certified public accountants must earn Continuing Professional Education, or CPE, credits to maintain their CPA licenses. CPAs receive certificates of attendance that indicate the number of CPE credits, format of the CPE, and title and practice area of the CPE. CPE requirements ensure that individuals holding CPA licenses remain knowledgeable about and current on developments in the industry. For all PMI certifications except the CAPM®, you’ll need to follow the Continuing Certification Requirements (CCR) program and earn professional development units (PDUs.) The goal is to ensure that your certified competencies stay relevant and up-to-date. Subscribe with our newsletters and receive news about our events.